Replacement filters will fit the following Berkey systems: Big Berkey, Royal Berkey, Imperial Berkey, Crown Berkey, Berkey Light, Travel Berkey The Black Berkey Filters are self-sterilizing and cleanable. They remove a wide range of contaminants and far exceed EPA and ANSI/NSF (Std. 53) standards. Filtration Specifications for the Black Berkey Purification Elements: Viruses 99.999% reduction; Pathogenic Bacteria 99.9999% reduction; Total Chlorine - Below lab detectable limits, Volatile organic compounds - Below lab detectable limits, Heavy metals - 95% for most metals. Also removes or reduces Arsenic 99%, MBAS 96.67%, Nitrites 95%, Selenium 97.5%, Thallium by 99.5%, as well as rust, silt, sediment, turbidity, foul taste and odors. 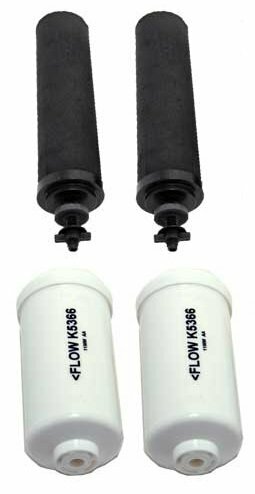 The Fluoride filters work with the Black Berkey Elements and remove 95% of the fluoride from your water. They will also reduce the levels of Arsenic III and V, MTBEs, and other heavy metal ions. Black Berkey Elements remove 99.999% of viruses, 99.9999% of pathogenic bacteria, chlorine, volatile organic compounds including pesticides and herbicides, and 95% of most heavy metals. If you have any questions about this product by Berkey, contact us by completing and submitting the form below. If you are looking for a specif part number, please include it with your message.